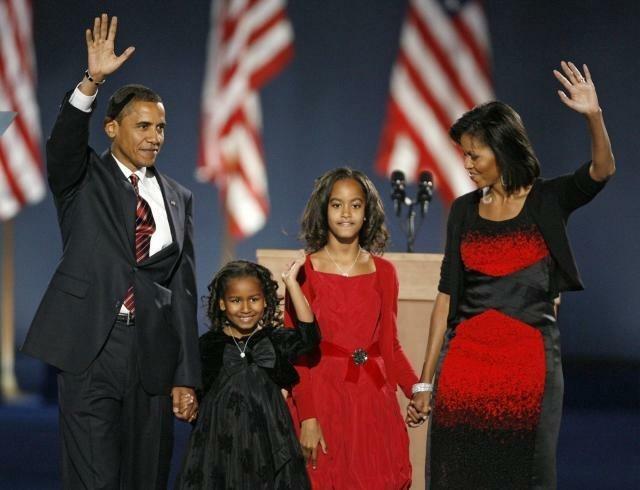 President elect Barack Obama with his family on the night of his victory, Grant Park, Chicago. This year, once again, the Jewish community overwhelmingly supported the Democratic nominee for President. With the election of Barack Obama, Jewish voters selected a candidate who, despite an unprecedented smear campaign, represents the values of our community. This year, we also heard the all too familiar claims that the Republican nominee was going to receive a record amount of the Jewish vote. However, once again, this prediction came up woefully short. In every election cycle for the last 36 years, Republicans offered “sky is falling” predictions that Jewish voters would give significant support to the Republican nominee. A typical claim was when President George W. Bush’s campaign Chairman, Marc Racicot, predicted in 2004 that Bush would garner between 30-35% of the Jewish vote. Despite Republicans’ history of failed forecasts of the Jewish vote prior to 2004, their delusional claims persisted. In 2004, the media largely bought into the argument that Bush would receive a significant portion of the Jewish vote. A New Republic piece by Lawrence Kaplan titled, “Kerry's Jewish Problem,” typified the media’s fascination with the prospect that Senator John Kerry would receive an unusually small portion of the Jewish vote. The media frenzy led many to give credence to Republican claims about the Jewish vote four years ago. Despite the Republican theory about Jewish voters, results from Election Day 2004 showed the usual overwhelming Jewish support for Kerry. In fact, since 1972 (when exit polls where first instituted), the Republican nominee has averaged only 27% of the Jewish vote. In recent elections, the Republican nominee has received even less than that with Jewish support of 22% (2004), 19% (2000), and 16% (1996). In 2006, the Jewish support of congressional candidates reached 87%. Nonetheless, the media remained enticed by persistent Republican claims about the Jewish vote during this election cycle. The endless attempt by the media to report the “man bites dog story” instead of the more usual “dog bites man” led to news articles titled, “Obama’s Jewish Problem” (Politico, 3/13/07) and “Obama's Struggle to Secure the Jewish Vote” (NBC, 5/23/08). Once again, this year’s supporters of the Republican nominee and members of the media prematurely reported that McCain would receive a dramatically increased percentage of Jewish support with Obama as the Democratic nominee. In the early months of the general election, the polls projected Obama would receive about 60% of the Jewish community’s support. Sensing an opportunity to capture a sizable number of Jewish voters, McCain supporters engaged in an unprecedented anti-Obama campaign in the Jewish community. This campaign not only included efforts to paint Obama as an anti-American Muslim, but it also implied that an Obama presidency may bring a second Holocaust. The anti-Obama campaign waged by many McCain supporters was widely criticized, and it outraged many in the Jewish communities they targeted. As Election Day drew closer and the Jewish community learned more about the two candidates, polling showed that Obama’s support in the Jewish community increased to between 70% and 74%. Ultimately, the Jewish community supported the Democratic nominee in overwhelming numbers. According to exit polling from Tuesday’s election, Obama received 77% of the Jewish vote – about 26% greater than Obama’s percentage of total support nationally. Every four years, like a broken record, we are subjected to the refrain from Republicans that “this is gong to be the year the Jewish community votes Republican,” but it never proves true. Somewhat prophetically, Ethan Porter of The New Republic got it right last week when he reported, “the fear that Jews might desert the Democratic Party comes up every four years [...] this theory might finally be put to bed.” Indeed, as it has for the last three decades, the theory that Jewish voters will significantly support the Republican nominee has once again been discredited. Marc R. Stanley is Chairman of the National Jewish Democratic Council.